St. Gregory’s Abbey was the site for birdwatchers this chilly, moist Saturday morning. The gray clouds hung low in the sky, but not one drop of rain fell during our field trip. Horned oak galls have dominated a pin oak by the Labyrinth. The old tree is covered with woody wasp shelters that house the developing larvae of the cynipid wasp. Although they appear as tumors, the wasp galls tend not to destroy a tree unless it is heavily infested, as is this tree just leafing out. Now would be the time to rake and remove all twigs and leaves and apply fertilizer. OBU is taking over Benedictine Hall for classrooms as well as the theater. The Green family (Hobby Lobby) purchased the university side. Soon all the streets will have names of the Green family, etc. A large multi-purpose building on the abbey side is under construction for future use to support the abbey mission. Blue bird houses and eggs are currently being sold locally. The world depends on birds! A roadrunner poked its head, then body, out from the redcedar hedge. Gold star moment. Mockingbirds flitted from the ground up to the wires above. Doves appeared and cooed here and there. Brown-headed cowbirds were out searching for nests. At the other side of the old tree-lined swimming hole flew one Great Blue Heron up and out of sight. Canadian geese were quietly camping at the eastern edge. 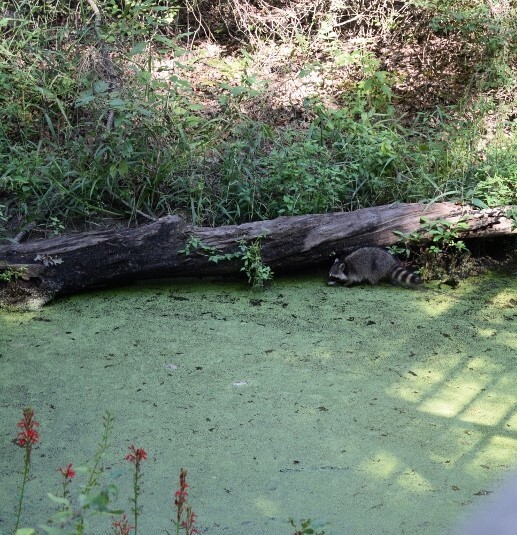 The striped skunk meandered along the base of the pond and rapidly disappeared into the trees. Frogs sang, hidden by the vegetation. A bald eagle is known to be in the area. Hawks keep an eye on the chicken grazing area. 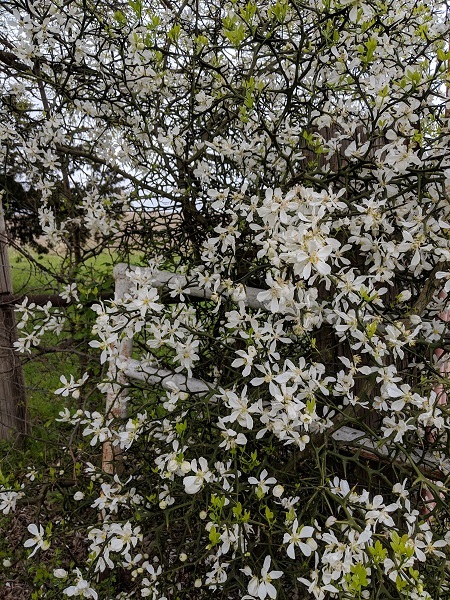 We walked past a Trifoliate orange tree in full bloom mode. The lemon scent of the flowers was light and delicate. 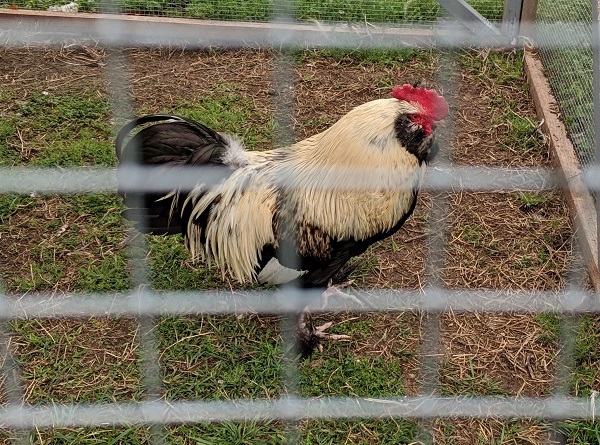 Jungle fowl are being raised somewhere on the premises. The meadowlarks kept singing in the open fields beyond, but we just could not locate a single bird. Standing by student housing we heard the clear song of said bird, crept over to the hedge, peered through the branches and saw, sitting on top of a small tree, this meadowlark as proud as punch. Nearing the end of our trip we paused to look at the camel tongues jutting out from the former Student Center. 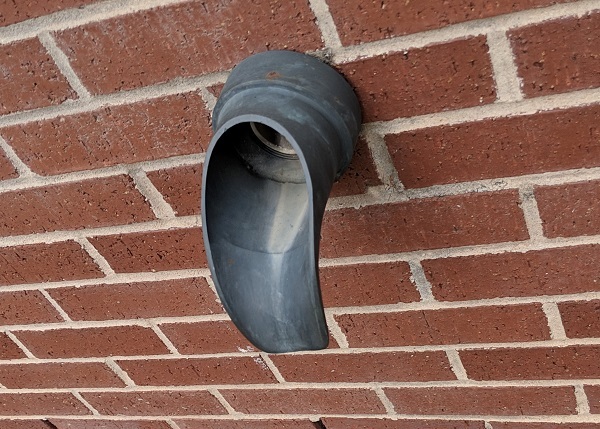 The imaginatively named camel tongues (cow or lamb tongues) are downspouts that direct water from the roof away from the building. 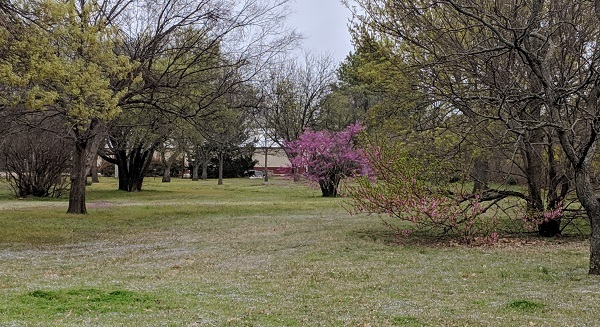 The Crabapple tree was covered in deep pink blooms. The question is what is the difference between a daffodil and jonquil? The conclusion: jonquils have multiple blooms on one stem and a stronger scent. Of course there is a daffodil called Narcissus jonquilla and all daffodils are in the Narcissus genus, so a jonquil is a daffodil and a daffodil could be a jonquil. St. Gregory’s Abbey is a tranquil place to observe the birds and wildlife. It was a great field trip. 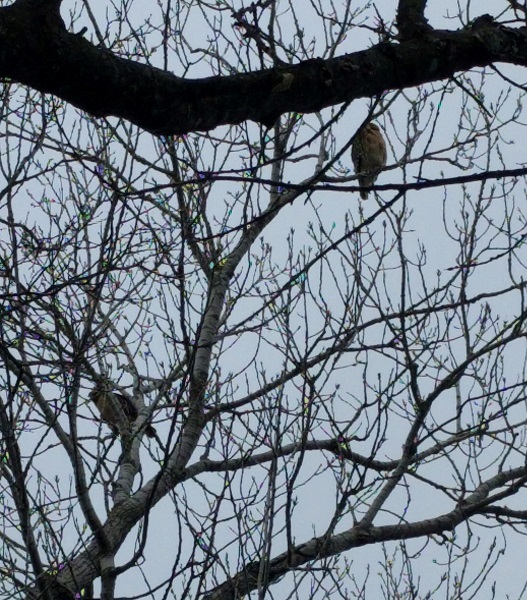 The morning (about 10:00 am) at our house was filled with a lot of commotion and kee-aahs as two red shouldered hawks flew in circles over the trees and our house. The female landed on a large branch in the cottonwood. The male did his “sky dance” as he sang and flew in large circles. The big bird descended and flew close to the female then rose up as he soared in another wide circle around the tree only to drop back down near the female.. and once again spiraled up. The screaming of the bird was intense. He obviously was on a mission. 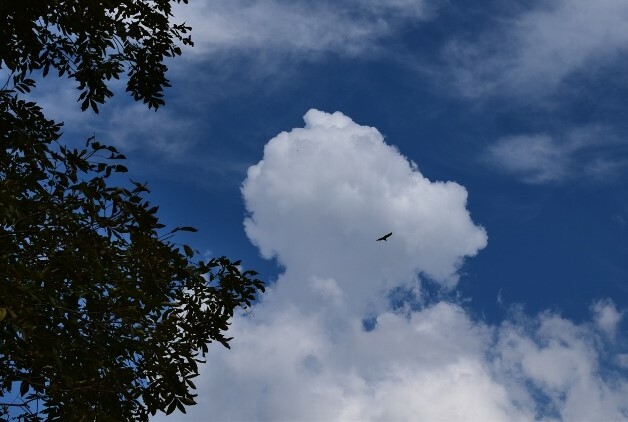 The bird performed his fancy maneuver a few more times before he plummeted down and landed…. right on top of the lady. Wow. It was quick, they fluffed their feathers and each took a separate branch and faced different directions. Who can figure out birds other than the obvious, or maybe not so obvious. We tried to figure out if the woodcock would show up anywhere around the 640 acres that contain the monastery ruins at Sacred Heart in SE Pottawatomie County. The group gathered at St. Gregory’s Monastery at 5:00 pm ish and looked at the sky. The temp was 37 degrees and dropping, winds were over 10 mph from the north and our area had just been placed in a Winter Weather Advisory for freezing rain and fog. It was one raw afternoon. The trip to Sacred Heart would take at least 40 minutes or… ..we could drive to Tecumseh Lake in 10 minutes and wander along the edge of the fields across from the lake. Can you see the woodpecker on the truncated trunk (Left)? the reeds and grasses by the water, a flock of at least 2 dozen juncos, some unidentified sparrows (one member quipped he saw little brown birds), one small hawk, probably a Sharp-Shinned hawk, pursuing prey, and 2 male mallards chasing a female mallard. Best of all, a red-headed woodpecker was busy excavating the top of a truncated tree by the water’s edge. That red head stood out in the gray murky atmosphere and made the trip worthwhile. At 6:30 pm we walked along the road toward the water treatment plant, carefully listening to sounds from the open fields dotted with a few small redcedars. This was a good area east of Tecumseh Lake. Woodcocks like moist soil with earthworms. Straining our ears, a distant peent or squeak sound was heard periodically, but the traffic noise from I77 interfered. No bird was ever spotted doing the sky dance into the air, but the consensus was we may have heard the woodcock. Where we think we heard the woodcock. Hey, it works for us! Good birding trip. The freezing mist began falling as we returned to Shawnee. Dinner at the Phoenix Restaurant. Good timing, hot tea and hot soup! The Old Farmer’s Almanac predicts the first frost for Meeker, their nearest climate station which sits 925 feet above sea level, will be October 21st. Well, the mornings of October 15th and 16th were pretty chilly. The preceding weekend was a dizzying display of pruning, digging, moving (often with a dolly), repotting and repositioning dozens of plants. Most were wheeled into the greenhouse. Autumn is a beautiful time of year, but very bittersweet. My emotions cycle from heart-wrenching sadness to pure joy. It was the season my mom and dad left this earth, but during the fall both my sons were born. I say goodbye to some of my favorite plants, but know others will overwinter and come alive next spring. The trees gradually shut down all food production. Their leaves change into various colors before detaching and falling away to the ground, leaving bare trunks and branches. Next year fresh leaves will emerge and the cycle of life begins anew. Mushrooms have been cropping up everywhere. These organisms not only make accessible nutrients to plants but are the supreme digesters of nature. Fingers crossed, the Monarchs are making safe passage to Mexico. The Scissor-tailed flycatchers formed large flocks that flew this past week to southern Mexico, Central America and a few veering off to Florida. True snowbirds. The Japanese Sister Cities delegates arrive in Shawnee October 24th to spend a few days with host families. They will tour the area to see the sights, hear the sounds and enjoy some Oklahoma hospitality. All too soon they leave October 29th. Shawnee Sister Cities delegates visited Nikaho this summer. Our unique exchange program has continued for 28 years. The Japanese Peace Garden (JPG) construction began in 1999 over a former airfield. The design is an artistic rendition of a peace symbol. The idea emerged in David Walk’s head on a trip to Japan. Three main paths, two with small covered gates, enter the serene center of the garden. The wood fence and the Bridge of Understanding leading into the Heart was constructed by cabinet maker Doyle Roller Jr and helpers. Brent and Mina Cory with dozens of volunteers laid thirty thousand square feet of sod. Ann Davis spearheaded the drive to add lighting and flags. 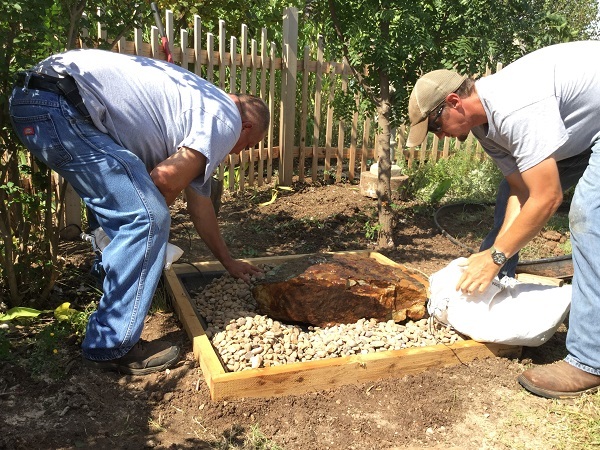 Beds of gravel and large stones were installed to imitate land, mountains and water. Through the years many features have come and gone. The Teahouse was funded by TDK and constructed by Don and Karen Wright. The Wrights planted elms, pines, cedars and willows, but many were wiped out in the 2005 drought. The two-tiered landscaping around the building for years was planted with colorful flowers. The 3.5 mile airport track that circles and intersects the JPG was replaced. Later arrived the addition of street lights along that walking path. The hardscape part of the Japanese Garden began to suffer from the effects of age and the harsh exposed climate. 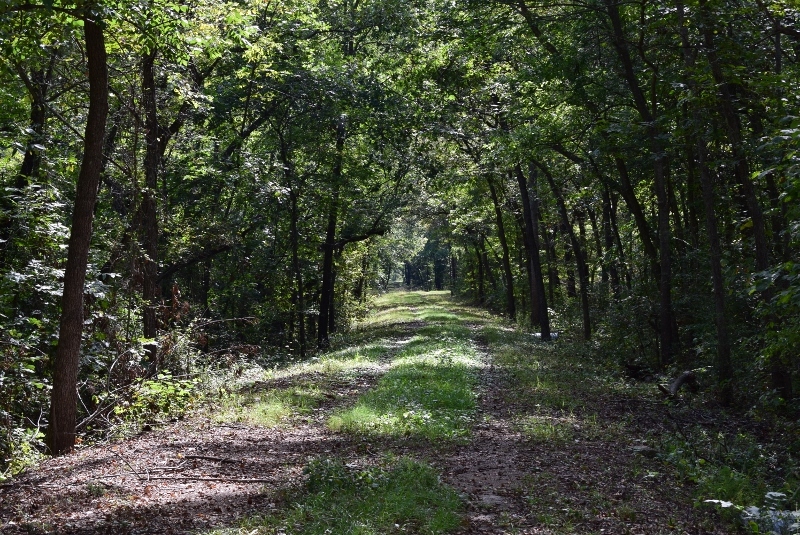 The paths were restored by the Shawnee Parks and Recreation staff. 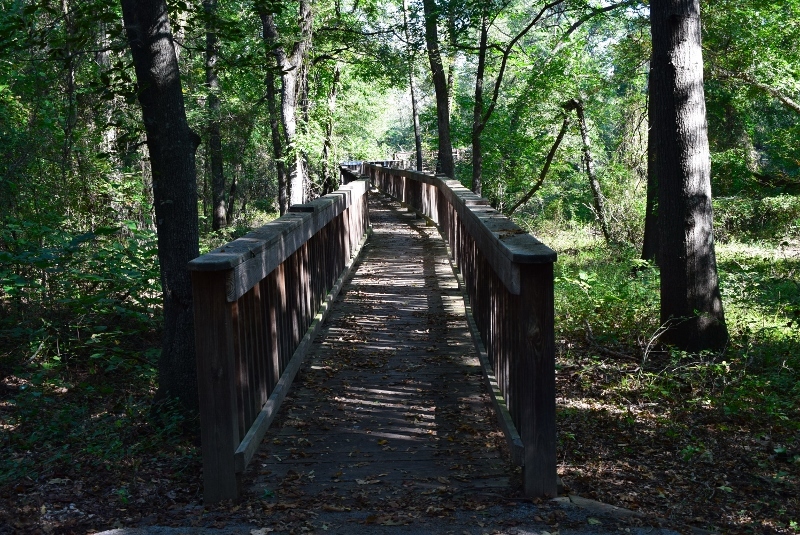 The Eagle Scout Project of Micah Swedberg included renovation of the paths inside the Heart of the JPG and rebuilding/repainting of the bridge with the assistance of Boy Scout troop 480 (sponsored by the First Baptist Church). Master Gardener Linda Smith and her husband Royce removed rotten landscape timbers around the Teahouse and replaced them with new. 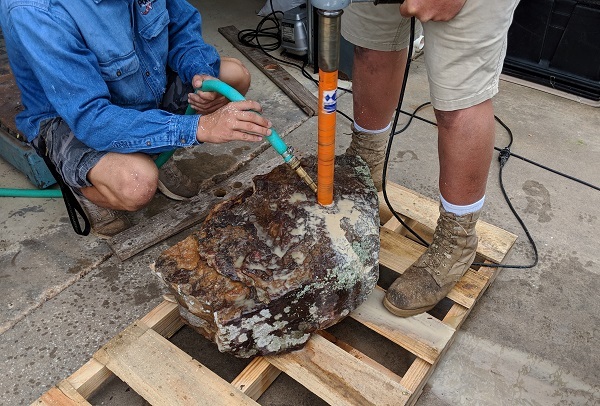 Drilling the hole in the rock. 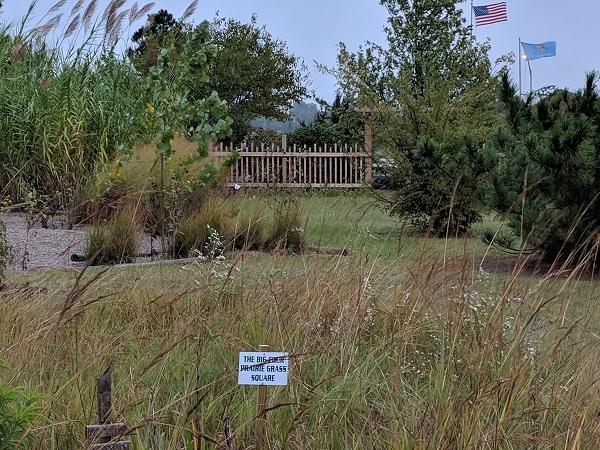 The Deep Fork Audubon Society donated the split-rail fencing around the Prairie Garden bordering a section of the airport fence. Shawnee Parks lent the use of their auger to dig the fence holes, but two Master Gardeners and their mates put up the entire fence. 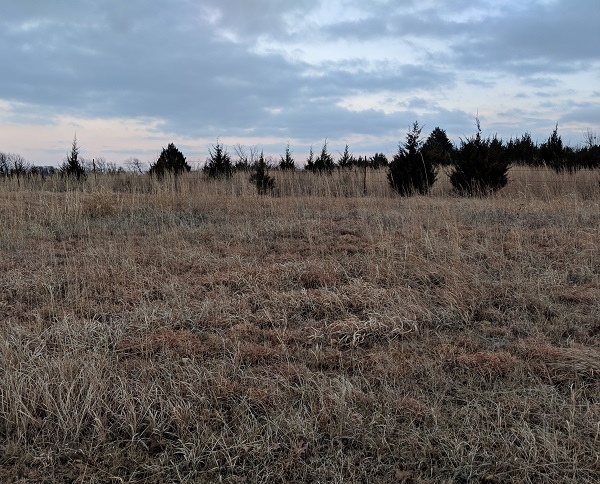 Within the prairie boundaries grow sunflowers, switchgrasses, Prickly pears, asters, bluestems, leadplants, Gaura, and dozens of other wild native plants. The Bridge was again painted by the Sister Cities delegates of Shawnee last year. The 7th grade students selected from surrounding Middle Schools each year participate in several community projects. They gather periodically throughout the spring and summer to clean, weed and do general garden chores in the JPG. OBU and Gordon Cooper students have many times helped in the JPG. The impressively huge ironstones in the JPG were delivered on sturdy flatbeds carted from many miles away. All were gifts of Dennis Craig. 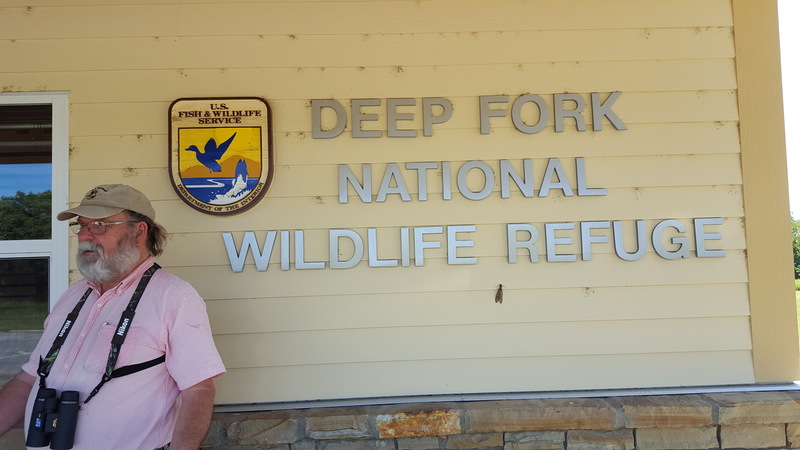 Jim VanAntwerp, Coordinator for the Shawnee Parks and Recreation Department, single-handedly replaced the dilapidating picket fence and two gates leading into the Heart. The long-anticipated water feature was about to become a reality. Due to the donation by the Deep Fork Audubon Society, a small group of dedicated birders, the lichen-covered rock from Pond Pro (actually the rock originated in southeast Oklahoma) had a hole drilled through the middle and was transported to the JPG with its 4’x4’ reservoir, sacks of small rocks, recirculating pump and equipment. The sticky clay in the interior of the JPG put up a fight as the large hole was excavated. 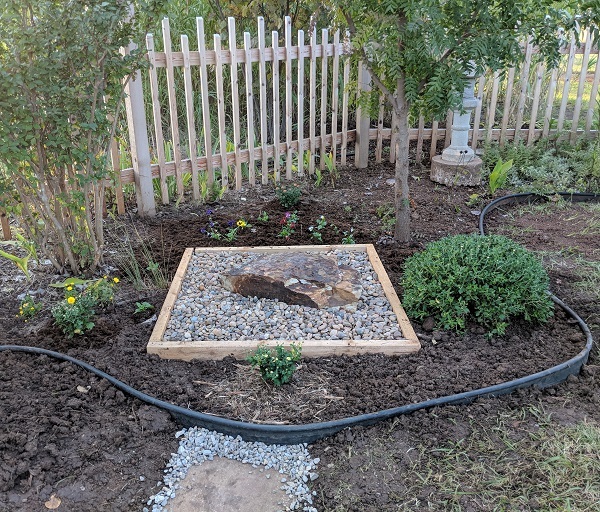 The plastic liner was nestled inside, paraphernalia installed, the rock placed over the pipe and laid on top of the reservoir support and bed of river stones. A simple wood frame enclosed the small rocky pond with the sound of a small burbling brook. It wouldn’t have been possible without the help of Jim as well as two city employees, Terry Moore and Kane McElfresh. Someone mentioned tongue in cheek the rock should be called Tranquility Falls! It went really well. It didn’t rain and was still sunny when I was there. The actual 25th Anniversary event had been postponed to October, but me and my dad still got to walk some trails and did some birdwatching. I actually had a lot more fun this time than the last time I was at the refuge because the weather was better and I got to see a lot more creatures. We got to see a great blue heron, egrets, and some killdeer at the Cussetah Bottoms Trail. 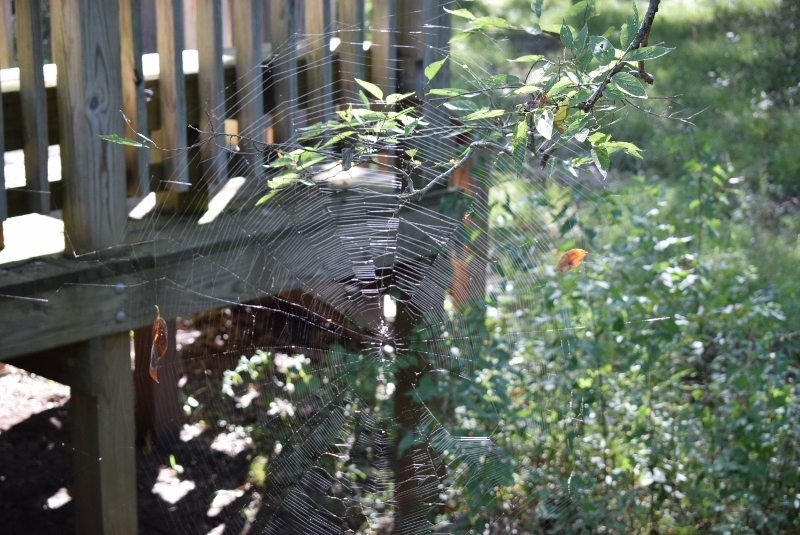 Also, I couldn’t get over how many butterflies and spiderwebs there were (see pics)! Attached are the pictures I took yesterday. Enjoy! 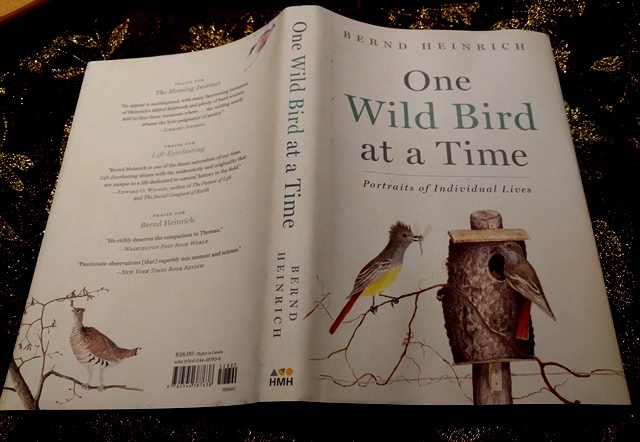 Know Someone who is Bird-Brained? It is dry. Last night a partially full water bucket kept in the kitchen was the object of interest for large black ants. They had collected around the inner edge and barely moved when the bucket was carried outside. They all went sailing as the water was tossed into the pine needles. The feisty ruby-throated hummingbirds are exhibiting a powerful thirst. They twitter (they really do!) and chatter around the house during the day. The noisy birds insist I need to change the feeders more frequently. Nectar levels are now dropping faster and in the heat for a few days the nectar may go to 50-proof. I know it is too hot and dry in the afternoon when the hummers and squirrels are nowhere to be seen and the cicadas cry for rain. Crow bread is a staple at my house. Numbering up to seven at times, the basic crow family consists of four. One squawks loudly before coming, with two others usually in tow. Unbeknownst to them, the smallest crow has already silently descended and gathered all the food it can every morning at 11 am. You could set a clock by the birds’ arrival. They voice their displeasure if no nibbles are present. The enigmatic crow. A bird covered in iridescent black shiny feathers with black bill and legs. Do you have crows? 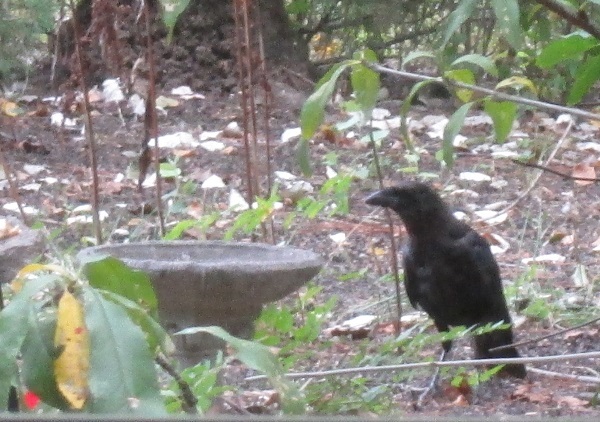 One Master Gardener has been watching crows dance over her yard and wondered if they ate bugs. Yes. They will eat almost anything from other birds, fruits, nuts, insects, eggs to carrion. 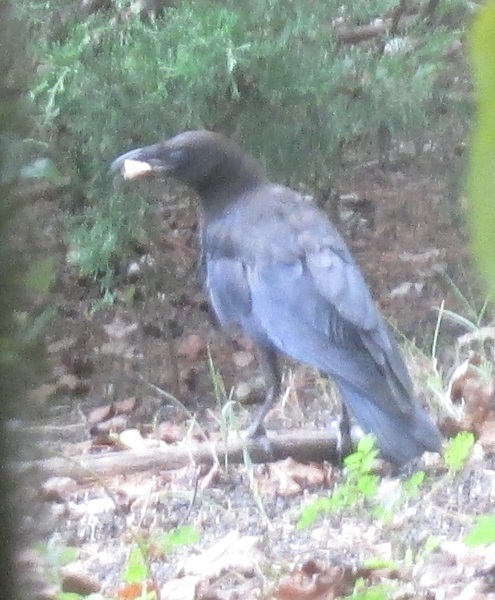 My crow family dines on leftovers and relishes small bones and most breads, except tortillas. Crows are one of the smartest groups of animals alive. 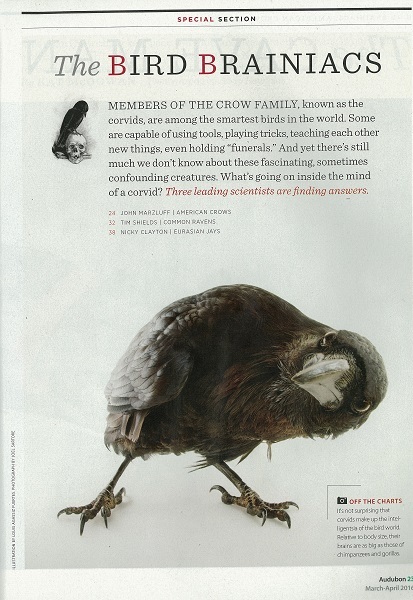 In the Corvid family, the name crow can be applied to 45 different species. The raven, a large crow, is ‘Corvus corax.’ Other than in Baltimore, MD, ravens live in Canada, western and eastern mountain regions in the US. The smaller American crow is ‘Corvus brachyrhynchos’ (long name that means short-billed.) The fish crow, ‘Corvus ossifragus’, is slightly smaller than the American with a weak nasal call, lives in wetlands and loves eating eggs of water birds. Both American and Fish crows can be heard and seen in our area. Our American crows probably know us better than we do. They recognize our faces, know our pets, and even have figured out our schedules. 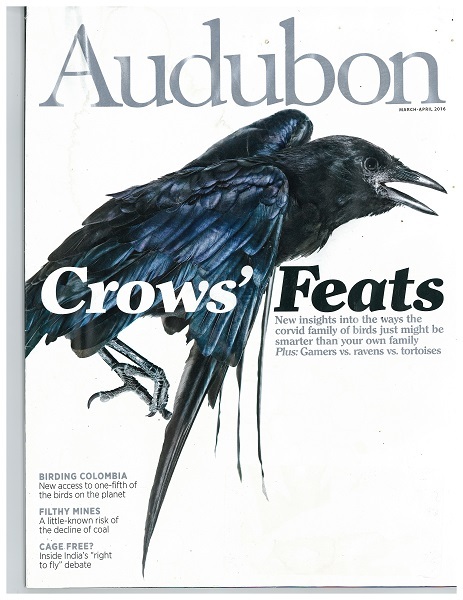 The March-April 2016 edition of Audubon magazine published a special section about crows titled “The Bird Brainiacs.” Crows have extremely large forebrains, the part of the brain that handles analytical thought and is responsible for their very adaptable behavior. One researcher called them “flying monkeys”. Proportionally speaking, their brain is every bit as large as that of a gorilla. Or some humans’ brains. Okay, the human brain is three times larger than the gorilla brain, but size isn’t everything. When crows hear or witness other crows in distress, they remember. They will form a mob, dive-bomb and scold the perpetrator. Good reason why a gang of crows is called a murder. If crows see a dead crow, they will surround the deceased, loudly caw then fly quietly away. These birds of long memories share their knowledge with each other, which may be one reason they can better adapt to environmental and habitat changes. Going it solo is not advantageous. As animal habitats decrease in suburbia land, the Brainiac article suggests backyards be treated seriously as bird refuges. Replace lawns with native vegetation, mark windows so birds don’t fly into them, and keep dead trees for nesting if in a safe spot. The only wild animals many people see are pigeons and crows. Building up suburban, community, town and city bird populations provides better chances for all birds to survive an uncertain future. The Outer Banks (OBX) of North Carolina is the place to be in early spring. The mosquitos have not resumed control of the airspace yet. Birds migrating along the Atlantic Flyway bird migration route either pass directly over the barrier islands or find places to rest at the beaches, the forests of the coasts or the marshes. The resident birds don’t seem to mind. North Carolina has spent years developing a concentrated network of birding trails from the mountains to the coast. The living room and kitchen of our small third floor condo at Hatteras Village faced the Atlantic Ocean. 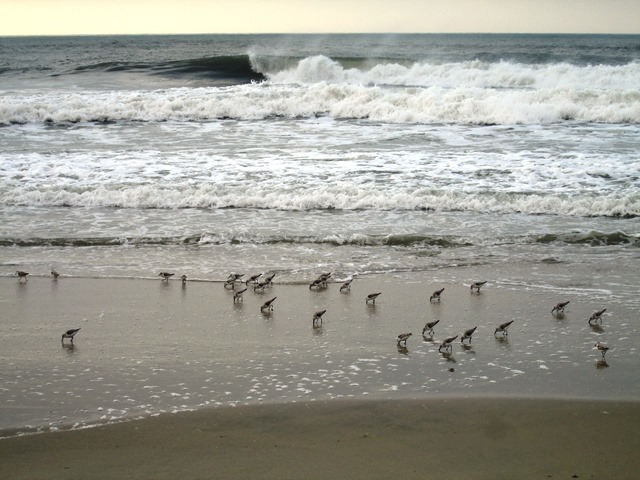 Every day you could watch the small Sandpipers and larger Sanderlings running back and forth as the waves flowed in and out. “Obsessive wave chasing” states Cornell. Assorted gulls would float, dive or fly above the water. Boat-tailed grackles hopped through the brush on the dunes and washed up debris on the shore. Dolphins and whales that spouted large plumes swam beyond the breakers in the deeper waters. Buxton and Frisco Woods are considered a natural maritime Atlantic Coast evergreen forest community. 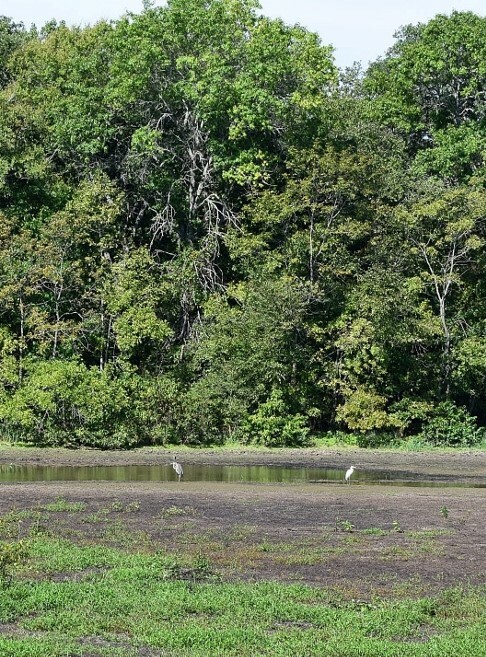 They have fresh water ponds, sand dunes, grasses, thickets and coastal vegetation. Several paths traverse the sandy soils that support the loblolly pines and live oaks. American holly, wax myrtle, yaupon, greenbriers, grapes and poison ivy form the underbrush. The native Carolina Jessamine vine was in brilliant bloom. Its clusters of yellow tube flowers could be seen wherever dashes of sunlight hit their living trellises; plants the evergreen vines climbed to get to the top and more light. 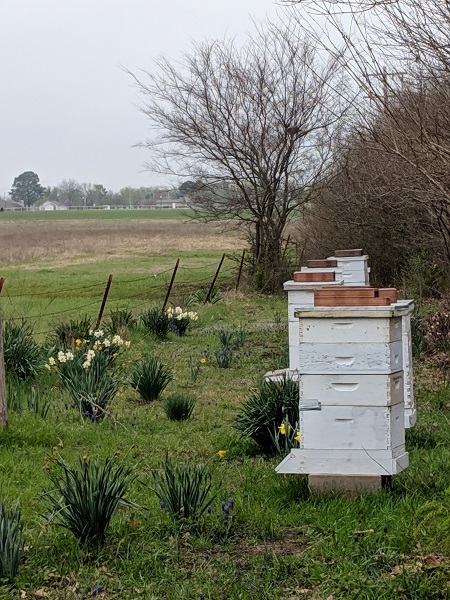 The flowers are toxic to the non-native honey bees, but the native bumble bees love the blooms. In other words, there is ample food for birds and other wildlife. My goal was to find waterfowl. We looked at the Hatteras Lighthouse before driving down the road to find the path to the Open Pond and British Cemetery. In 1942 a British tanker was hit by 7 torpedoes shot by a German U-Boat cruising just off Cape Hatteras. Half the crew drowned, but two washed ashore and were buried in the Buxton Woods. The fenced mini-cemetery is considered British Territory. The Open Pond was reported to be home to a variety of birds. After two miles of walking down the pine root and needle strewn sandy path, we found ourselves at the Open Pond. 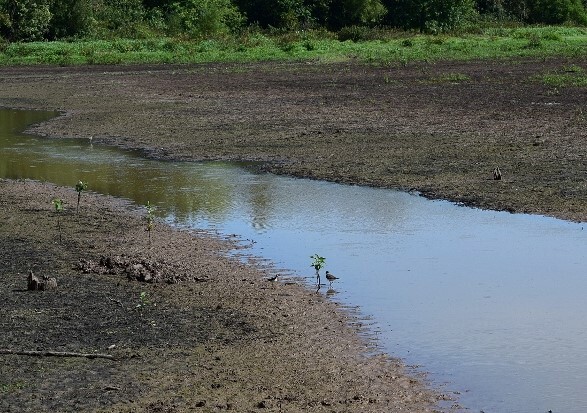 It was a swampy, tree-filled area of stagnant water. 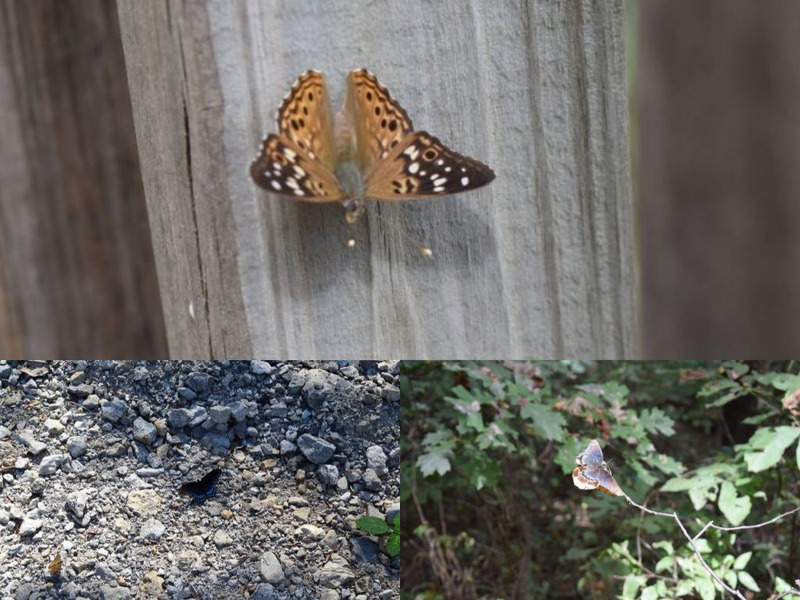 The only things flying around were pine warblers, red-winged blackbirds, Carolina wrens, a few turkey vultures, dragonflies, bumblebees and small butterflies. Had we had the time to cover the entire wooded and coastal area, we might have seen Ruddy Turnstone “Calico Cat” ducks, different dabbling and diving ducks, kestrels, Northern Harriers, plovers, terns, avocets, sandpipers, gulls or any of the nearly 400 species that live at OBX. The Laughing gulls giggled overhead as we ended our frustrating search. After I threw a small fit, we regrouped, grabbed sandwiches and drinks in Avon, and drove 30 miles north to Pea Island National Wildlife Refuge. It was about five in the chilly afternoon with a fierce north wind. What birds in their right mind would be hanging around the large ponds and wetland areas. Guess again. Two mated pairs of Northern Shovelers (ducks with large, scooped bills; the males have green heads and are patterned in russet and white), 25 Gadwalls or American Black ducks (both resemble female mallards from the distance where I was standing), 3 brown pelicans, 5 snowy egrets, 4 coots, the ubiquitous red-winged blackbirds, 15 Canadian geese, one juvenile Tri-colored heron and two pair of Bufflehead ducks. So cool. Bufflehead males have deep greenish purple heads with stark white patches at the back of the head, white necks and bellies. The females have whitish cheeks. The ducks dive out of sight, only to pop up later in another place. No Tundra swans, white pelicans or snow geese were present. The large birds had departed very early from the refuge a month ago. Two hours later we began to drive back south to Hatteras Village. The sun was setting. Suddenly hundreds of Double-Crested Cormorants in V formations began crossing over Highway 12 flying west. Their flashing yellow bills were the only bits of color that could be distinguished as the long necked birds flew in formation. This lasted over 20 minutes. Breathtaking. 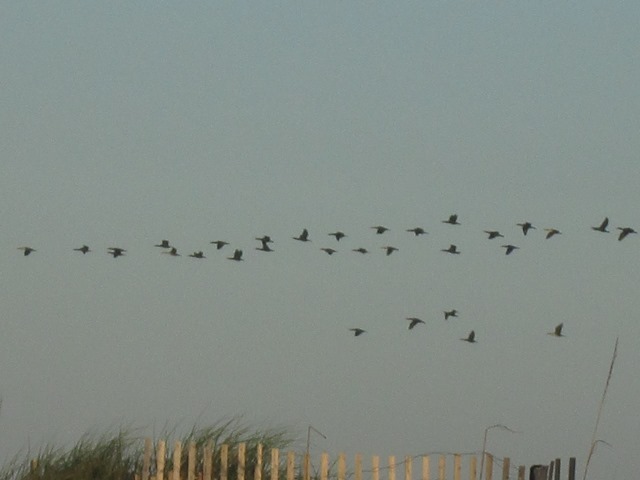 They fly to the Atlantic each morning and return to the bay every evening. Can you find the American Oystercatchers? Yaupon hollies, wild olives, needlerush (a type of junco grass), southern red cedars and live oaks dominate this preserve. Oyster shells are being hauled in to be used as fill to build up and anchor the coastline. I only saw Herring and Laughing gulls hovering above us. But wait. We drove to the inlet and walked out to see the Civil War Monument by the public boat ramp facing the sound. 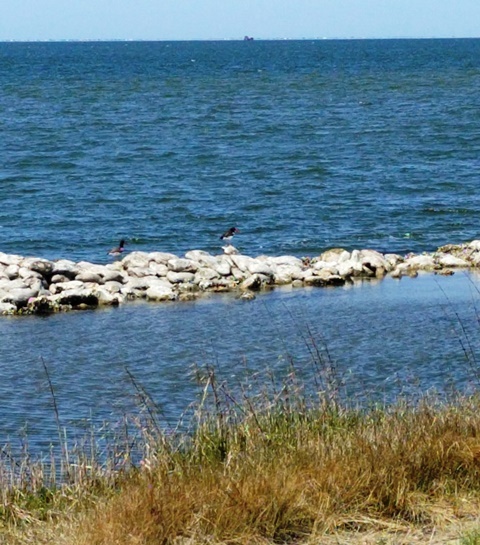 Two good-sized birds with large bright orange-red bills and bold black and white markings were busy investigating the water between the loose rocks that formed the riprap stone barrier. They were American Oystercatchers. These shorebirds mate for life and return to the same place to nest each year. The pair was foraging for mussels, clams and other creatures that live in the intertidal zone around Ocracoke. What a great find. The Tower at Lake Tecumseh. 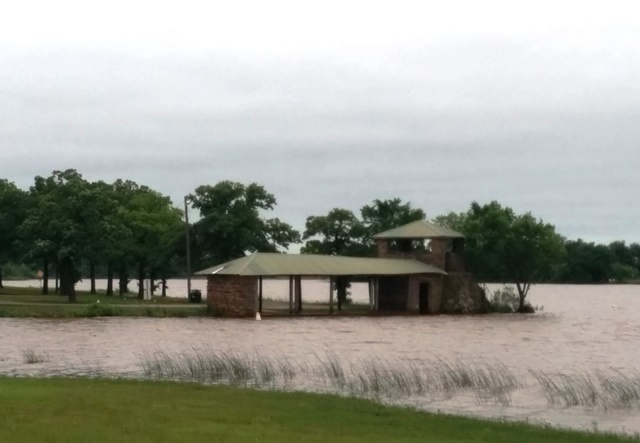 after the May storms 2015. 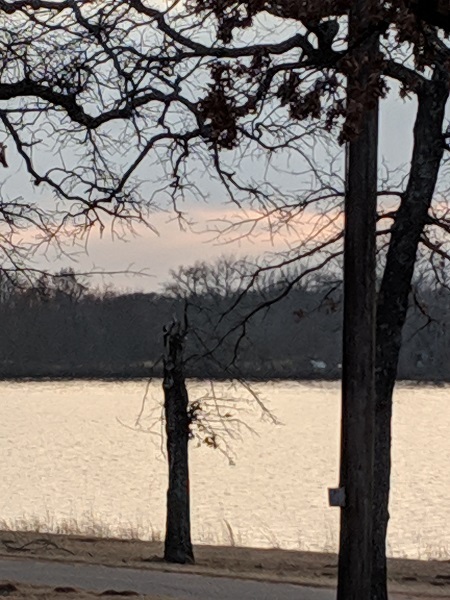 The selling points for Lake Tecumseh are boat ramp, grills, picnic area, overnight camping, a pavilion, a playground and 3 miles of shoreline surrounding 127 acres of water. 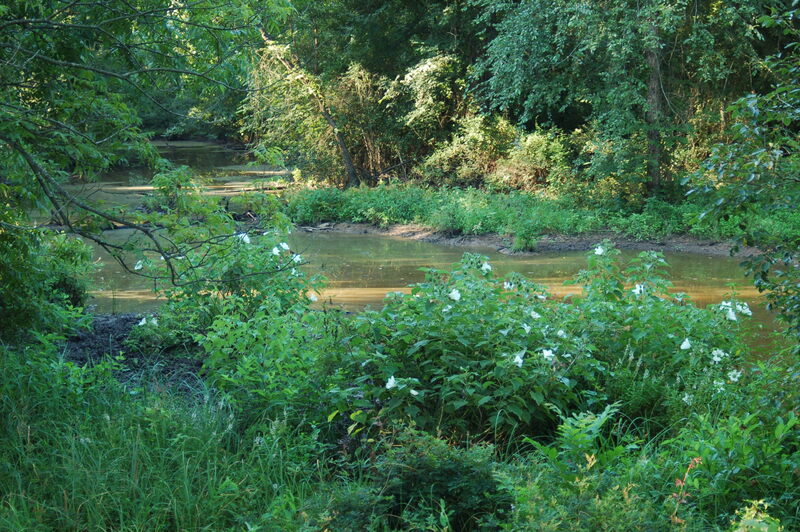 A small dam is located in the northeast corner. The “Tower” is a landmark building in the picnic area built by the Civilian Conservation Corp (CCC). This organization provided jobs, shelter, clothing and food for young men during the Depression. In return the workers helped develop the natural resources in rural areas. From a satellite’s perspective, Lake Tecumseh appears as a statuesque face, facing left, with sculpted hair, prominent lips and a short pig tail at the back of the head. A long neck extends to a truncated bosom. The profile could have fit in with the other 887 statues on Easter Island. The Deep Fork Audubon Society had decided to have a field trip last Saturday morning at Lake Tecumseh. Although the weather was predicted to be cold and rainy, the rain stayed to the north, but strong cold winds came south. The air flowing over the water made the forty five degrees feel like below freezing. Even our binoculars and the birding telescope were shivering. The greatest difficulty I had was holding my binoculars in my mittens while trying to keep the Hot Hands from falling out! Despite the uncomfortable conditions, we managed to see four cormorants coast right above the surface of the water. Double-crested Cormorants are larger black water birds with long necks. They hang around our area in the winter to do a little fishing. Our ornithologist spotted 19 Ring-necked ducks on the other side of the lake…with his telescope. The male duck wears a striking black and light gray feather coat, does have a faint chestnut neckband but much more noticeable are the two white bands around its bill. The female is tan, but also has a faint ring around her bill, the reason why these diving ducks are also called ‘ringbills’. Keeping their distance were three Gadwalls. Gadwalls resemble Mallards in size, but have low-key grey-brown coats and white wing patches. They like to steal food from other diving ducks and were probably just floating-in-wait until the ringnecks caught fish. My best find of the day was a Yellow-bellied or rumped warbler. The little insect eater was streaked in yellows and dark browns and stayed on the left side of the oak tree. Three bluebirds had taken over the other side. Spunky Dark-eyed Juncoes foraged for seeds on the ground under some trees and a Great Blue Heron flew overhead. The Great Blue Heron look and sound so prehistoric. They not only wade in the water, but walk in fields and pastures. The birds can quickly strike their prey with pointed bills or crunch them with strong mandibles. Not only fish, but small mammals, reptiles, amphibians, and other birds are all fair game. The Great Blues hunt both day and night as they have good night vision. Somewhere in the background trees, the White-crowned Sparrows delivered sweet clear whistles ending in trills. Crows, no doubt pestering something, squawked in the distance. A hawk, possibly Cooper’s Hawk, soared above us, but vanished before we could get a positive identification. Of course there were the dozens of sparrows that flew in tight formations throughout the shrubbery. Other birds were present, but we left them to go on their own merry ways.